Brian McHale, one of my favorite teachers, invited me to submit an abstract to ASAP/3. ASAP, while somewhat cross-disciplinary, is primarily a humanities style conference, with most people reading prose off of densely written essays, while the audience listens intently, hands on heads signifying deep concentration. This made me somewhat self-conscious about my GDC design track style talk, and what I identified as a need to entertain and appear witty. As game designers, professional purveyors of fun and pitchers of designs, the entertaining presentation format is a game we are trained to play. My original intent was to write a scholarly paper explicating the design principles underlying the Spore Creators. Writing the paper for a non-game development audience would force me to really introduce and succinctly explain all of the implicit context—from Richard Dawkins to Xerox PARC—and ideas that went into the design of these tools. In the end, I only had a 20 minute slot to fill, so I had to condense my focus. As the conference approached, and the talk had to be built, I re-read my abstract and panicked, because the abstract was really good: it promised a well thought out big picture design history that leads to the Spore editors, plus an explanation of how they tick and are informed by this back story. In the end, I focused mainly on the historical parts, and am pleased with where I landed, and the adjacent terrain to explore. 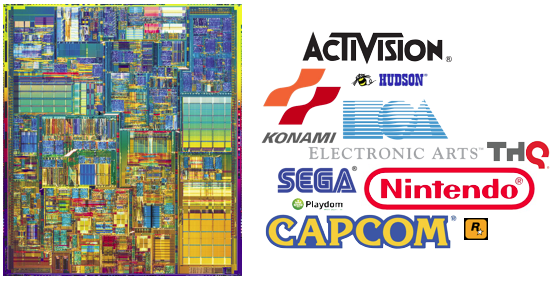 I’ve been reading social histories of technology and play, which certainly colored my approach in this talk. The conference itself was interesting, even if I did feel a bit like I crash landed on an alien planet. Part of this was because it was in Pittsburgh, which is close to where I grew up, but not a place I have spent much time in as an adult. So there was this sense of uncanniness in the location, but also in the discourse. The Association for the Study of the Arts of the Present is focused on the contemporary arts, but this is partially aspirational, as the majority of the the scholars felt like they came from literature departments, and most of the arts talked about were actual paper and glue texts. While doing my BS and MS I spent a lot of time around this kind of discourse, but not much since, so there was another layer to the alien familiarity of being there. That said, while there were many talks I was bewildered by, the conference was full of interesting people, talks, and random references that caught my fancy. I will now produce a random remix of notes and references for your enjoyment. Jeremy Green had a paper on the Sandia report on long term waste storage, which I remember reading about as a kid. (If you poke around online you can find the full text to download). 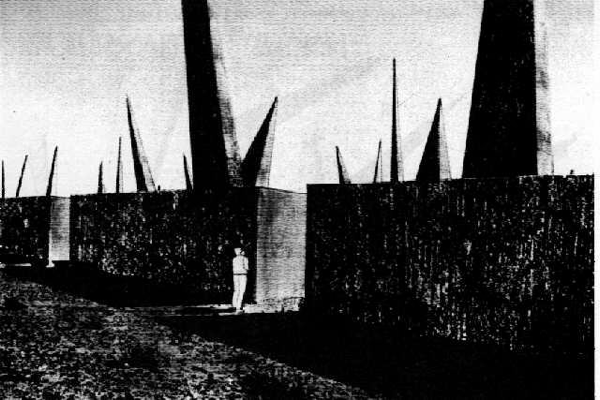 The government was trying to figure out how to bury and store nuclear waste for thousands of years and ensure that in the alternate futures they envisioned people would understand not to mess around with the site. I learned that Katherine Hayles has a paper on AD/HD: Hyper and Deep Attention: The Generational Divide in Cognitive Modes. Krzysztof Wodiczko gave a talk on his fascinating work, which revolves around producing artifacts that mediate between people, enabling those who have less of a voice (immigrants, high school students) to share and communicate on normally difficult to talk about subjects. 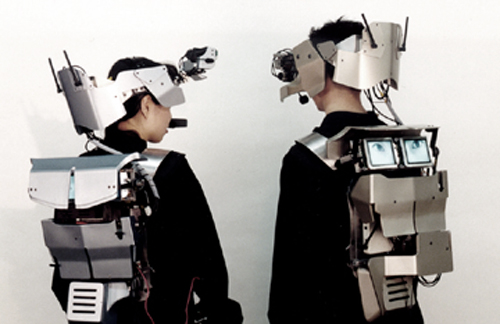 For example, he built a Gundam inspired suit for a Japanese high schooler so that she could communicate with people while facing away from them (shown below). Despite, or rather because of, its playful, high tech, and attention drawing design, some very honest, emotional, and moving conversations were had that we were shown videos of. Jesse Matz, a film scholar, examined film’s depiction of and use of prosthetic technologies for time, analyzing Source Code, Limitless, and touching on Groundhog Day. Life is a loop we must iterate on until we learn to care, and get things right. Which sounds an awful lot to me like a game. Amy Elias looked at paper and glue books, like House of Leaves, which scholars have identified as ergodic, which is news to me, as I had only heard this term applied to digital artifacts. Ursula Heise, another film scholar, examined the intersection of environmentalism, animated films, and post-humanism. She described animation as the 20th century art form for visualizing agenthood in inanimate objects, which reminded me of Sherry Turkle’s description of the computer as a liminal object between alive and dead, as perceived by children. She looked at some of Ghibli’s work (of course), and focused on Pom Poko. I learned that Eisenstein wrote about Disney’s animation, using the term plasmatic to describe the hyper real shifting, stretching, and transformation animated entities can undergo. Heise argued that the plasmatic is a fantastic way to acknowledge the shifting nature of natural forms. Scott Bukatman, who was a no show, has an exciting new book coming out called the Poetics of Slumberland, which is about the plasmatic in cartoons, comics, and film. Little Nemo is on the cover! Leila Nadir, an artist and scholar, described her work as post-disciplinary. She touched on a fluxus inspired app she built that leads users on procedurally generated urban hikes, which sounds like a lovely idea. Heather Houser critiqued data visualization as art. Daniel Punday examined computing as writing, focusing on the depiction of this process in The Social Network. Susan Kozel and Svitlana Matviyenko are dancers who built/performed a piece called IntuiTweet that tied together multiple dancers across space via twitter, which was a lovely image that leads us to see even those of us who are not dancers, but use twitter or cell phones, as participating in a network that propagates physical sensation and feelings (you shimmer when getting a tweet or phone call, for example).